A healthy resting blood pressure, less than 120/80 for adults, is essential for heart health. Unfortunately, both age and sedentary living increase blood pressure. More than 50 million Americans have high blood pressure, according to the American College of Sports Medicine. 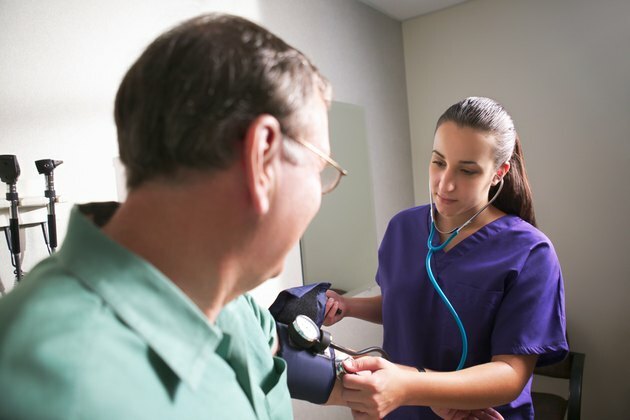 Elevated blood pressure means elevated risk for heart attack and stroke. Aerobic exercise can diminish this risk by decreasing your blood pressure; exercise can be as simple as taking a walk, riding a bike or doing yard work. If you have been inactive, check with your doctor before beginning an exercise program. Of all exercises, walking is probably the easiest to fit into your schedule. 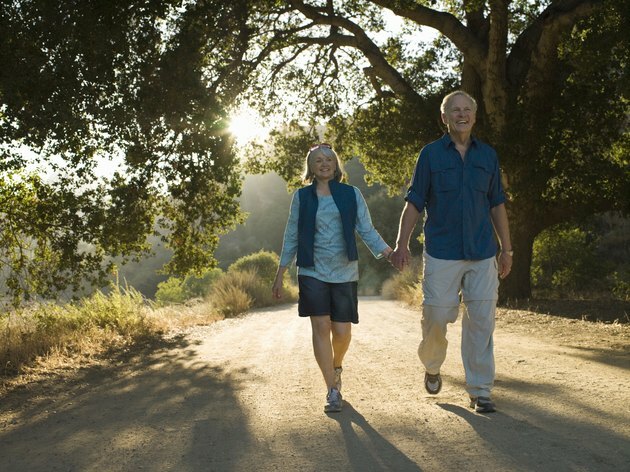 A few weeks of walking at least 30 minutes a day at moderate intensity is often enough to lower blood pressure. Moderate intensity means that you can still carry on a conversation without pausing for breath, but perhaps not sing, notes the U.S. Centers for Disease Control and Prevention, or CDC. Keep in mind that 30 minutes of walking can be broken up into 10- or 15-minute intervals, or interspersed throughout the day. Instead of parking close to work or the store, take the farthest parking space and walk. Take the stairs instead of the elevator. Walk at lunchtime, or walk to the mailbox instead of stopping on your drive home. 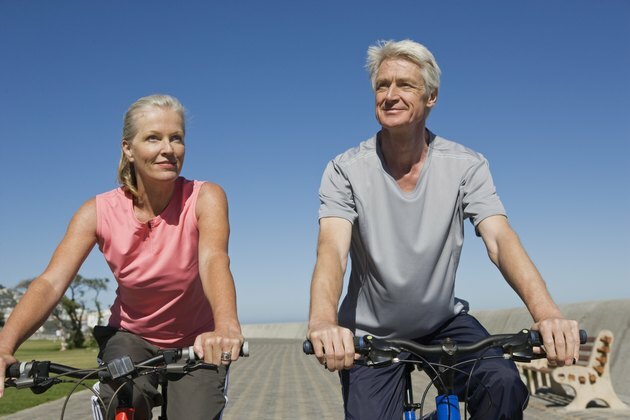 Cultivate an active lifestyle and you will decrease your chances of developing heart disease by up to 45 percent, according to "The New York Times Health Guide." Riding a bike at moderate intensity, less than 10 miles an hour over level ground or with few hills, can also lower your blood pressure. As with all exercise, if you have been inactive, start slowly and gradually build up speed and stamina. Whether you ride a stationary bike at home or at the gym or prefer a traditional bike outdoors, biking will benefit you. The 2010 benchmarking study by the Alliance for Bicycling and Walking concluded that in states where levels of biking and walking are higher, the incidences of high blood pressure, obesity and diabetes are lower. The CDC recommends at least 150 minutes a week of moderate-intensity exercise to stay healthy. 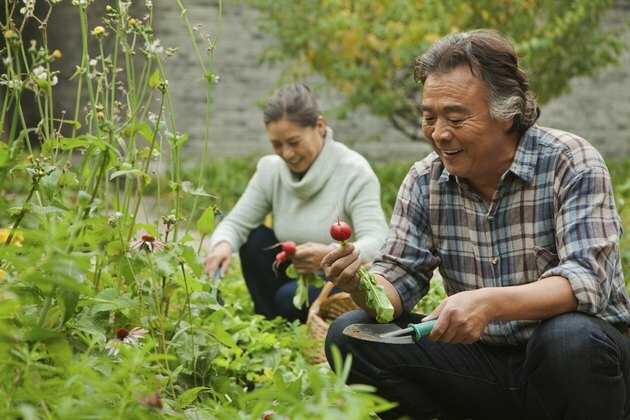 Gardening or other yard work such as mowing the lawn can also provide the moderate-intensity exercise you need to lower your blood pressure. Moderate-intensity exercise requires you to put forth some effort and break a sweat to get your heart rate up to target range, which is 50 to 70 percent of maximum. To estimate your maximum heart rate, subtract your age from 220. Remember that it's OK to get your exercise in 10 or 15 minutes at a time and that variety will likely make it easier for you to stick to an exercise program. Mix it up throughout the week and get your heart beating faster with different activities. Stick with it -- the benefits to your blood pressure will last only as long as you continue to exercise.